Cornucopia Plus™ Formula X is simply the best grow and bloom all-purpose fertilizer available. 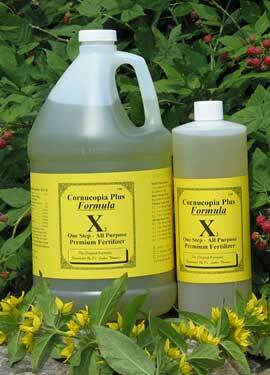 A popular and proven fertilizer, Cornucopia Plus™ Formula X provides both growing and blooming elements. Organic metabolites supply plants with energy sugars. Cornucopia Plus™ Formula X is formulated to provide plant ready nitrogen for both soil and soil-less growing media, and contains no urea. Cornucopia Plus™ Formula X has consistently demonstrated a positive effect on all flower and vegetable test plants. Stem strength is constantly apparent throughout the growing trials, while plant leaves become larger and achieve a darker green color. Flowers, house plants, and herbs all respond to Cornucopia Plus™ Formula X with accelerated growth producing herbs with pronounced improvement in aroma and flavor. Herbs and lettuce growth is accelerated with sweeter scent and excellent taste. House plant leaves are greener and larger, with greater drought resistance. Cornucopia Plus™ Formula X is excellent for hydroponics or soil. The development of essential oils in herb and aromatherapy plants is dramatically increased. Cornucopia Plus™ Formula X is very simple to use and that another of its many advantages.